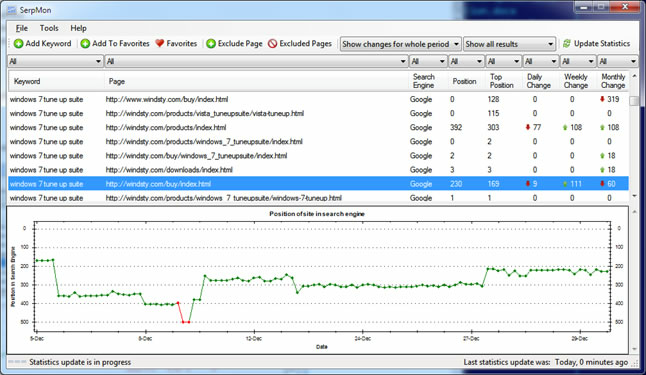 SerpMon (Search Engine Results Page Monitor) enables you automatically check your search engine position ranking for any keyword. You can see how a specific keyword position has changed over time in a vivid graph. Whatever you do to optimize your site you must know how it affects your site position in search results. If you do something and your rank goes up - you are on the right way. Don't let your competitors outrank you. Why do you need SerpMon? * Automatically checks your search engine rankings * Search engine rankings at your fingertips * Monitors where your competitors rank * Keeps track of the ranking history * Shows if your site moved up or down in search results * Effective site promotion is impossible without rank monitoring * You'll be able to track your keyword ranking progress as you try to improve your website's keyword search ranking * Checks all keywords ranking in several minutes. Manually checking them would take hours. That is time SerpMon saves you Features: * Automatically updates keyword ranking on schedule * Internal database keeps your keyword ranking history * Shows if your keywords positions went up or down * Desktop popup notifications when selected page changes position * See if your keyword rankings have moved up or down in a vivid graph * Multiple filtering to results * Favorites and pages to exclude list * Free support and advice * Free lifetime updates and upgrades * System requirements: Windows XP/2000/2003/Vista/Windows 7 Download SerpMon now and have search engine rankings at your fingertips! This site does not contain serial number, crack, keygen SerpMon serial number : serial number is the simplest type of crack. A serial number(cdkey,product key,etc) is register the program as you may already know. a crack or keygen may contain harmful software. If you cannot find the exact version you want, just give it a try. for more information read .nfo/.txt/.diz file include in zipped file.